It looks like the Genesis Engineering Solutions single-person spacecraft is coming right along; it passed several important pressure tests last month. Technovelgy readers may recall reading about it a couple of years ago; see Cool 'Single-Person Spaceships' Have Better SF Name. The spacecraft concept from Maryland-based Genesis Engineering Solutions is just big enough for one person; an astronaut would float inside the spacecraft for several hours and use robotic arms to manipulate equipment. Propulsive thrusters would allow the spacecraft to nestle close to a target, similar to NASA's Manned Maneuvering Unit jetpack that was briefly tested on astronaut spacesuits in the 1980s. Instead of using a bulky spacesuit to do repairs on NASA's future Lunar Orbital Platform-Gateway space station, for example, the Genesis spacecraft operator could use the robotic arms while remaining in relative comfort inside of an enclosed cockpit. ...the lower part of the suit was simply a rigid cylinder. When I climbed inside it, I found that I could use my feet only to work some control pedals, which I was careful not to touch. There was a little seat, and a transparent dome covering the top of the cylinder gave me good visibility. I could use my hands and arms. Just below my chin there was a neat little control panel with a tiny keyboard and a few meters. If I wanted to handle anything outside, there were flexible sleeves through which I could push my arms. They ended in gloves which, although they seemed clumsy, enabled one to carry out quite delicate operations. True science fiction fans will also want to check out the the Osprey space armor from Salvage in Space (1933) by Jack Williamson, as well as Larry Niven's singleship from Death by Ecstasy (1969) and just for fun the space bubbles from The Planet Strappers (1961) by Raymond Z. Gallun. Thanks to Winchell Chung's (aka @nyrath) of Project Rho. '...the lower part of the suit was simply a rigid cylinder.' 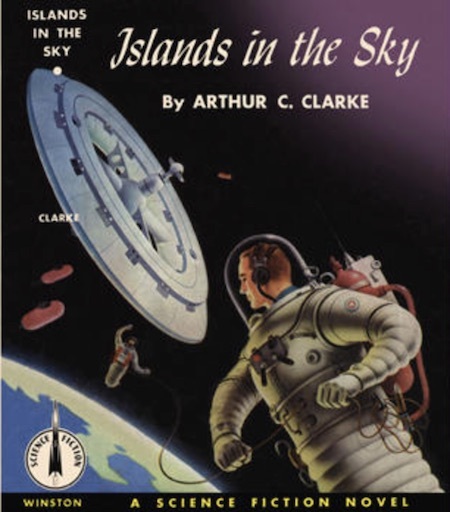 - Arthur C. Clarke, 1952.